I like Will Smith but Im not sure his voice lends itself to the role. I will definitely at some point end up watching it so we'll see how he does. Why is he doing his bad boys sthick for this? God this looks like hot trash. Jaffar doesn't even look evil enough. I will say, Naomi Scott is looking like a very nice Jasmine. 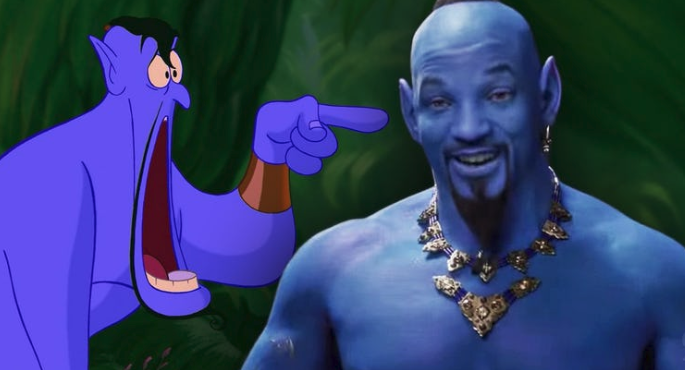 “I’m sorry but Will Smith as the Genie in #Aladdin is nightmare fuel. Also, he’s just gonna use his regular Will Smith voice?" This looks all kinds of off... the casting, their re-interpretation into CG... wow. It looks like a university project with a moderately high CG budget. Looks fantastic. Must watch film is must watch. Jafar looks alright, I think the casting of a younger guy kind of kills the evil villain vibe.....but he doesnt have a menacing evil voice....and that totally killed any villain vibe that was there. they should have used Ben Kingsley, that guy was made for villain roles. And back to will smith.... His line delivery needs to be less “will smith” and I think it could work.....but he talks the same way in all his comedies which makes it hard to not hear his genie as will smith genie. Plus that atrocious genie cgi..... I mean from what we’ve seen just painting him blue would have the same effect.... why didn’t they just create a ghostly looking genie with cgi that kind of looks like will smith....instead we just get will smith cgi’d blue. I haven't been following this at all and decided what the hell, I'll take a peak. Ok, I'm out and I'm never coming back. ...or seeing this ridiculous Disney reboot. Sony Bravia X900F 49" / HP ZR24W 24"
I don't have sound where I work so I dunno if it sounds better. Genie still should have been more caricature/cartoony looking when in Genie mode though.....Kind of like Jim Carrey in the Mask. I would say it's better than the last trailer.... Although, that's not hard to achieve. The rest of the visual look good though I will say. Still looks like one of those cheap Netflix ripoff movies rather than a real Disney movie. What is up with the janky effects? Maybe they want it to look like a cheap movie from India or Bollywood. It's a better trailer, but like Athena I think it looks like a Bollywood knock-off. Still a hard pass for me. It looks like it will be terrible unless you're 8. Major gripe is with the voices of the actors. they seem too high pitched. Jasmines is fine, Aladdin is fine for the most part (would prefer if he had a deeper voice though), Genie is fine. Jafar…..good god why does he sound like a pretty boy...its laughably not intimidating at all. Its like seeing a physically intimidating tough guy who turns out to have a little boy's voice. And CGI'd blue Will Smith as genie looks ok in motion but still doesn't look right. 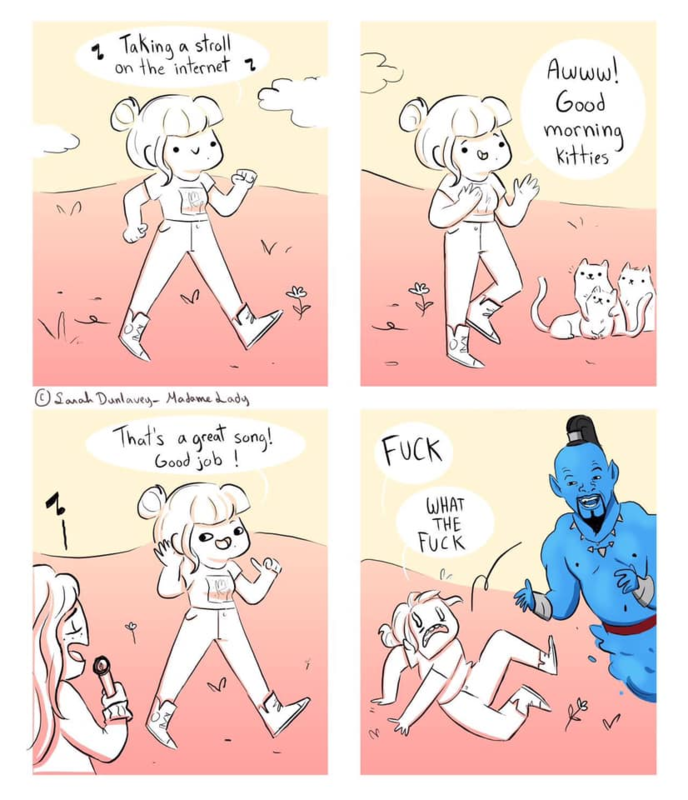 I mean, turn him into an imposing ghostly looking figure with exaggerated features...not..."It was easier for us to just Digitize Will Smith instead of painting him blue and have him act all the Genie things when hes in blue genie form"